Some of us have with continuing to purchase cookbooks. No matter how hard we try to resist, publishers have a way to break down our resolve. 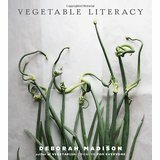 Vegetable Literacy by Deborah Madison is one such book. This large book has over 400 pages and is so gorgeous that it should be sitting on your coffee table to impress your friends. The photos are not only of finished dishes (you can just smell the goodness), but are close-ups of the vegetables in the garden or on a plain backdrop. Deborah Madison has been at the forefront of vegetarian cooking for over 30 years. She is the author of over eleven cookbooks with simple, seasonal, vegetable-based cooking. She definitely knows this subject. How could we resist her latest offering of ‘a celebration of the diversity of the plant kingdom’? Today we will share with you Chapter Eleven, The Legume Family: Peas and Beans. Ms. Madison gives us a detailed background on the Leguminosae family, the oldest of cultivated plants, and the third largest in the plant family. Whether eaten green or fresh, these are still considered legumes. Her recipes are for both the fresh vegetable and the dried peas and beans. The Food and Agricultural Organization (FAO) recognizes 11 primary pulses. The first eight are most familiar to us: dried beans and peas, board beans, chick peas, cow peas, pigeon beans, lentils, and peanuts. The rest are: alfalfa, vetch, lupines, hyacinth bean, and jack beans. Alfalfa, a member of the pea family of Fabaceae, is usually grown as a cover crop and animal feed, but can be eaten as sprouts. The rest of the world grows and eats a good many other varieties of legumes. Lupini or wolf beans are grown from Lupines. Tamarind has pods that contain goo-coated seeds, and the paste is used as a tart seasoning in Indian cooking. With Jicama, we eat the roots, not the seeds. Fenugreek is eaten as a spice, an element in curry blends. Wisteria is a legume, but is poisonous. Scotch Broom is a legume with its pea-like blossoms, but it is not eaten because of its toxic alkaloids. Check out Seed Savers Exchange, Slow Food’s Ark of Taste, or heritage bean growers Bill Best and Steve Sando for more bean and pea varieties. Recipes start with descriptions of the particular legume, such as fresh peas and dried peas. Ms. Madison includes a list of ‘Selected Varieties’ that, presumably, she likes the best. ‘Kitchen Wisdom’ includes types and descriptions of what we should be looking for at the grocers, or better yet, the farmers market. ‘Good Companions’ for this food include a recommendation on which oil, spices and herbs, or other vegetables to pair with this legume to bring out the flavor. Then there are the fabulous recipes. Yes, as promised, the recipes are simple, elegant and delicious. I have twelve ‘Food Families’ to explore in this wonderful book, just in time as the vegetable growing season begins.